I am not a big fan of sweetened oats porridge recipes and always struggle to finish a bowl of oats. Hence, I always settle on the savory versions of Oats like Dahi Oats, Oats pongal, Oats Bisibelebath, Oats Kharabath. I have a version of Oats-fruits shake in my blog which I really like. 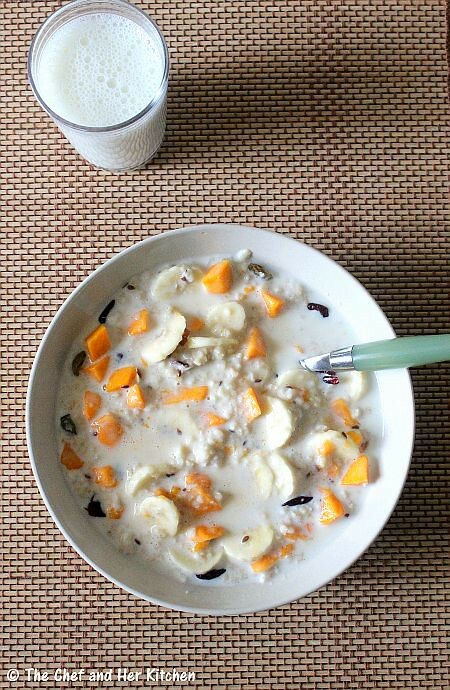 When I try adding fruits to the hot oats, it curdles sometimes and also fruits does not taste good in hot milk and hence I stopped making it as I don't enjoy plain or sweetened oats. Of late, I found a version of oats with fruits which really suits my taste buds.I precook the oats with water and just before serving, I add lukewarm milk with lots of fruits and dry fruits to it.I do not add any sweetener to my porridge, as the natural sweetness and slight sourness of fruits and dry fruits makes the porridge taste just right. While it is one's personal preference to add sweeteners like sugar or honey for this recipe, If you are a not a fan of oats porridge like me, do give my version a try. I am sure you would also change your mind after trying this.You can play with the ingredients and make the porridge according to your taste. If you have interesting porridge recipes, please mention them in the comments, I would be happy to see your versions too. Slightly roast oats for a minute on medium flame.This step is optional but makes the porridge less sticky. Boil 1 cup of water and add oats to it and boil for 2-3 mins until it is done.Let it come to the room temperature.This would form like a thick mass,do not bother .Once you add milk it would be alright. While serving add the lukewarm milk and vanilla essence(or cinnamon) to the cooled oats and mix well. Add cranberries(or raisins) to it and mix well. Transfer this to two bowls and top it with chopped banana,mango/apple,nuts and roasted flax seeds. Serve it immediately.Mix well and eat it immediately.You can add honey on top if you want,I did not add honey as the sweetness from fruits and cranberries were enough to me. 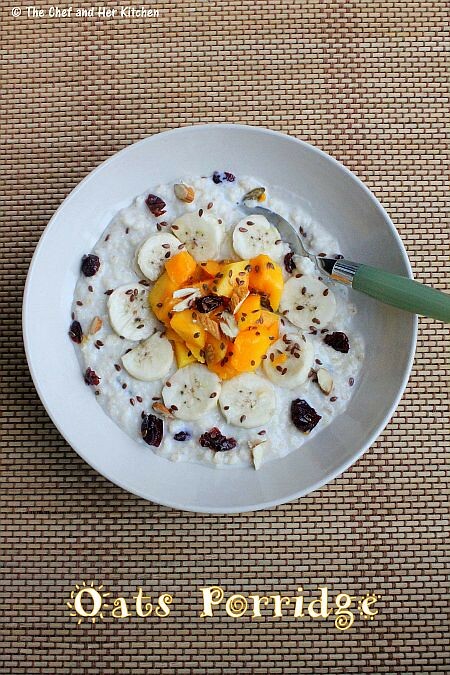 As the mangoes are seasonal you can add fruits like apple, pear, grapes, chikoo, pomegranate instead of mangoes.But make sure you add bananas to the porridge. You can boil the oats and keep them aside.But make sure you mix in the milk and other ingredients just before serving.Oats should be served as soon as it is prepared.As I am adding the fruits it might curdle if I add when it is hot and hence I follow this process and it tastes really nice if done in this way. You can skip adding vanilla essence to the porridge but gives a nice flavor.You can even add cardamom powder instead of vanilla essence in the recipe. I used elakki baale(Elaichi banana) variety in the recipe for this as I like the sweetness of it.You can use what ever variety you get. 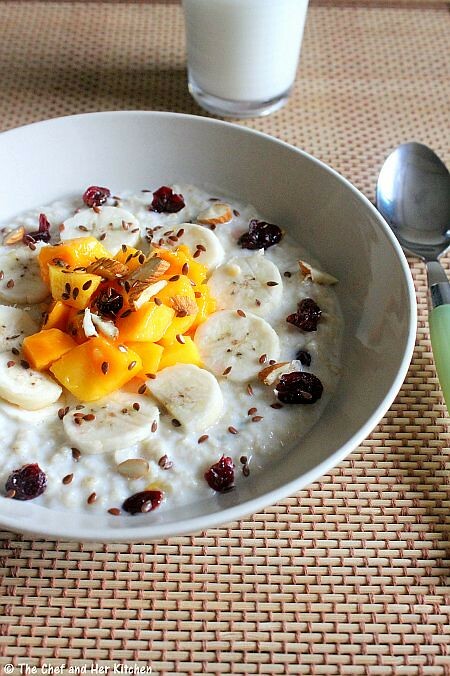 Healthy and delicious porridge.. Love the presentation too !! 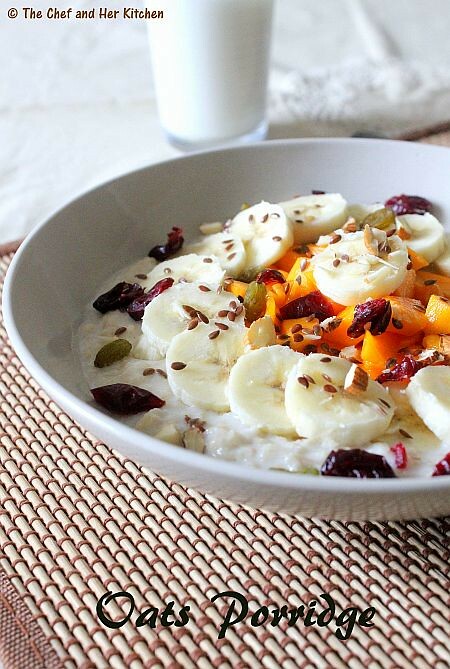 Such nice looking photos of oats with fruit. I always make oats in the microwave. Maybe I will toast the oats and then cook it. You should definitely give it a try...I've made twice this past week! But yours looks great! Will have to give it a try! 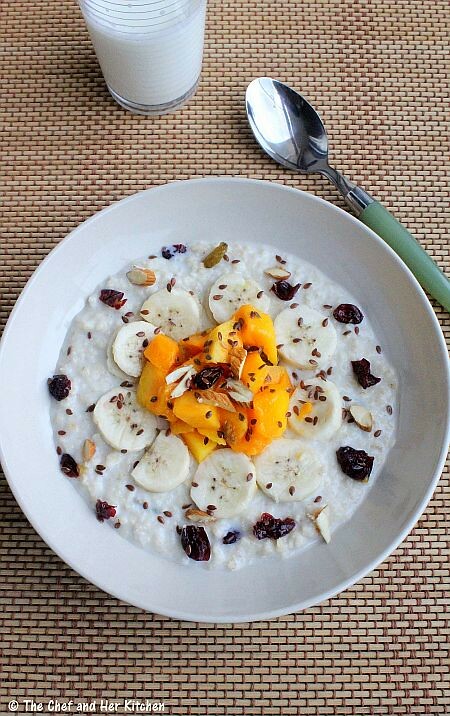 Wat a healthy and super filling porridge to enjoy without any guilt. Yum! Looks really healthy and tasty! 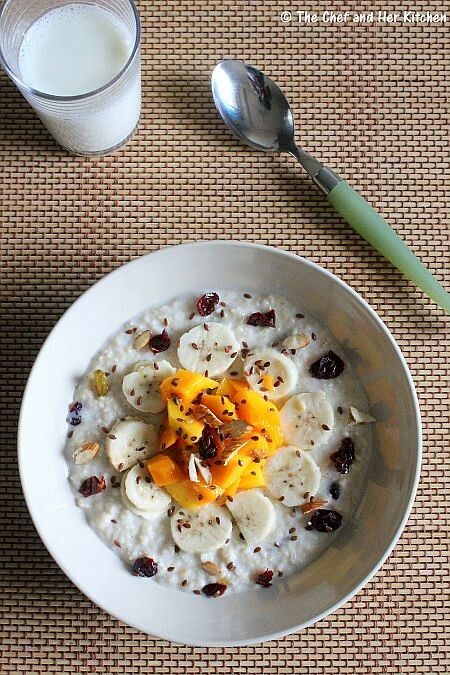 Very inviting bowl of Oats Prathibha, I am not a sweet oats person but this looks delicious. wow this looks good - never even thought of adding so much stuff to my oatmeal!